The Testo 875-1i represents a significant upgrade to the base model Testo 875. The “i” has some very important points of difference including upgrades to the detector, a fast 33Hz refresh rate, built-in visual camera and a much wider dynamic temperature range. For an entry level unit, this model represents outstanding value for money and is highly capable across a broad range of applications including but not limited to electrical, mechanical and building diagnostics. With a temperature range up to 350°C, the Testo 875-1i is plenty capable for the majority of electrical and mechanical applications. A key design feature throughout the entire Testo range is the -20 to 100°C primary range which keeps the thermal sensitivity sharpest for applications with minor temperature differentials, such as building sciences (moisture, energy loss, missing insulation etc). Unlike many of its rivals, the Testo 875-1i has a focus adjustment on the lens, allowing focus adjustment to just 0.1 meters (10cm). For an entry level camera, this is particularly important for obtaining sharp images and accurate temperatures at all distances, as many manufacturers now purposely omit focus functions reserving this for the higher end models. You will see manufacturers use terms like fixed focus or focus free meaning the camera must be utilized at a minimum focal length. That distance is typically anywhere from 0.6m to 1.2m which is quite far away when you are talking electrical system components. By comparison, using the Testo 875-1i at 30cm will deliver 4 times the resolution that the equivalent would achieve at 60cm. This means you can get much closer to your targets to improve your resolution and spot measurement size. At 0.1m the Testo 875-1i is capable of producing stunning images on PCB’s due to its ability to focus on up close objects. Is the image really that good? 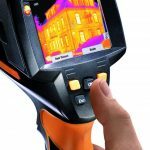 With a thermal sensitivity that is better than 50mk, the Testo 875-1i has long been recognized as the best choice for building diagnostics or any application where subtle temperature differentials need to be identified (equine/animals, pipework, ducting, PCB’s, research etc). With a thermal sensitivity that is almost twice that of its competitors, it is no wonder the image is crisp and clear. With the Super Resolution feature (optional) the Testo 875-1i produces a stunning 320×240 image that exceeds anything I have seen in this category. Is 32° wide enough? What if I want wider? Once again I must comment on how impressed I am with Testo’s choice of lens angle. A 32° wide angle lens since upfront of the Testo 875-1i and this is perfect for this type of camera. Any wider and you would sacrifice spatial resolution and the image would become noticeable pixelated at any reasonable distance. Any narrower and it is difficult to obtain enough perspective on larger targets (ie think indoor building inspections, motors, gearboxes etc). Many entry level cameras these days are exceeding 40° which reduces the image quality at comparable distances. Wider angle lenses use much less Germanium which keeps the cost down on this expensive component, hence the trend. The unit maintains a very respectable geometric resolution (IFOV) of 3.3 mrad and an impressive measurement field of view (MFOV) or Spot Size of 100:1. That means the camera is capable of measuring a 10mm target size at a distance of 1 meter. That puts its measurement capability on par with many other cameras that use much narrower lenses to achieve the same result. In real terms what does all this mean…. you get the best of both worlds; wide angle view for maximum scene capture and accurate temperature measurement. 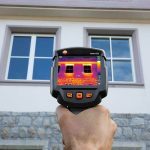 With these specifications in mind (resolution, thermal sensitivity and FOV) it’s easy to see why these units are favoured for structural thermography. This application places it’s highest demands on resolution and thermal sensitivity. The wide angle lens is just the icing on the cake. Another big step up for the Testo 875-1i is the inclusion of an onboard visual camera. While the resolution is not all that high, the image quality is good and more than sufficient for this level of camera. The 875-2i gets additional super bright LED for illumination in low light. Again the Testo 875-1i scores big points for the addition of a high-speed refresh rate. 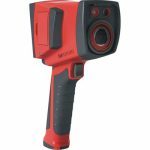 This is a must have for fast scanning or large-scale inspections. While I acknowledge that switchboards or walls don’t move that fast, the operator scanning them should. If you don’t want your inspections to take all day, as you become more proficient with your equipment then you will naturally want to increase your physical rate of scanning. 9Hz cameras do not lend themselves to fast panning of the camera, instead of the jittery and shuddering refresh rate forces the operator to slow down and be mostly stationary while in use. The 33Hz option allows rapid movement as the screen refreshes in real time provide a smooth and seamless image that can be observed on the fly. Walking through a structure (ie building or house) is no problem. If you are working by yourself and need to quickly pin point the exact location of an anomaly a laser pointer is a must have. Creating a trace on a wall surface or simply locating the right component in a switchboard can be done safely and quickly. Once thought of as a luxury add-on I would consider a built-in laser pointer as a must have function. As industry trends tend to move toward more compact devices, the Testo 875-1i still supports an ample screen at 3.5 inches. The larger size screens are still a pleasure to work on. More importantly, the angle is really good and allows the screen to be easily read under most conditions. The brightness is great and really illuminates even the smallest objects clearly and precisely. The camera does have brightness control, for those who might want to save some battery power. The save function is good, actually, it’s better than good, it’s excellent. Saving is as simple as clicking the trigger. It’s the next bit where the camera excels, and that is it gives you the opportunity to choose and name a folder to save your images, enabling you to easily sort and organise yourself in the field. While many cameras offer a similar function, this is done with great simplicity via the large icon user interface. It is literally child’s play. Before we get carried away with bells and whistles, let us not forget the most important aspect of saving… Displaying an IMAGE NUMBER. Following the save confirmation a large Image Number is displayed onscreen (for several seconds), allowing you to transcribe this all-important number to your running report/sheet/notes so that you can later identify which image you assigned to what asset. In my opinion, this is the deal breaker in any camera. While many entry-level models are becoming more toy-like in their feel and appearance, the Testo 875-1i has lost none of its industrial quality. The German build quality is outstanding. Plastic moldings are well finished (no sharp edges) and the casing fits together well without gaps or overlaps. Soft touches are added all over the unit with rubber panels and inserts on all the main wear and contact points. The buttons feel firm and have a positive sound and feel when pressed. They are made of firm rubber giving a quality feel. There is nothing worse than cheap hard plastic buttons that click loudly making you feel like you are playing with a kids toy. Definitely a tool! What’s it like to hold? The Testo 875 quite simply has excellent ergonomics. The pistol grip is highly contoured to fit your hand with a confident and natural grip feel. The buttons are within easy reach of my thumb, but it may challenge those with smaller hands. The unit is well balanced and weighted, unlike similar “pistol” style cameras that tend to be top heavy and require the user to really hold them in position. The manual focusing lens turns effortlessly to provide crisp clean images, the rubberized lens ring providing ample feel and feedback to the fingertips. I’ve written several times now about the Testo IR Soft software. Over the years this software has received some serious development effort and it shows. Now up to Version 3.4, IR Soft represents one of the best examples of reporting and analysis software on the market. 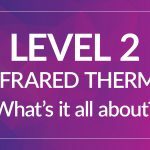 The best part is this high-end professional software is included free with every single Testo thermal imager. All updates a free. 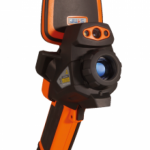 The Testo 875-1i is undoubtedly one of the best value for money thermal imagers available. View camera specifications & pricing here.